Southampton St. Louis: An Unconventional History book – PRE-ORDER today! 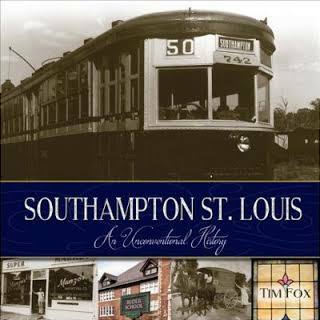 Southampton St. Louis: An Unconventional History is unlike any other local history book on the shelves. Assembled by a group of authors over a period of five years, it is not a scholarly book. Lavishly illustrated, it is more concerned with what happened than why–or, at least, that’s how a particular author remembered it happening. The book will interest anyone who has lived, worked, played, prayed, or learned in Southampton, one of St. Louis’s hottest and most stable neighborhoods. St. Louis’s Southampton Neighborhood is organized into six parts to capture various aspects of life in Southampton: * “Building Southampton” follows the neighborhood’s growth from the nearby Laclede-Christy Clay Works in post-Civil War St. Louis through the first houses that sprang up around the time of the 1904 St. Louis World’s Fair and after World War II. * “Living in Southampton” takes the “stuff” of everyday life–things and events we don’t notice when we are in the midst of living–and records them for posterity. * “Working in Southampton” documents changes that took place in the neighborhood’s business community from the 1930s to the 2010s. * “Playing in Southampton” delivers just what it promises: a lighthearted look at some of the games, hi-jinks, and attractions that have entertained Southamptonians–especially Southampton kids. We are accepting PRE-ORDERS right now. so ordering now is very helpful!